Searching for the best steam irons under Rs 2000? Just don’t get worried. For your ease and convenience, we came up with this blog post to help you pick out one of the best steam irons of 2019. Ironing is one of the essential household tasks required by most of the peoples in everyday life. Steam Irons are the latest technological innovation and a whole new way to keep your clothes looking like new. Just get rid of the messy clothes of your wardrobe by selecting one of the steam irons we have rounded up here. This one gadget comes with a steady burst of steam to vanish even the most stubborn wrinkles and creases and makes your linens and clothes looking like new. A steam iron is designed in such a way that pumps out the continuous steam to remove creases and wrinkles from the clothes. 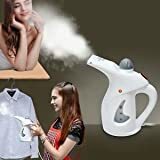 The steam iron contains a holding tank to fill the distilled water and the heating elements of the iron convert that water into powerful steam. The soleplate of the steam iron has some holes where the steam comes out to eliminate obstinate creases without overheating clothes and even affecting their quality. 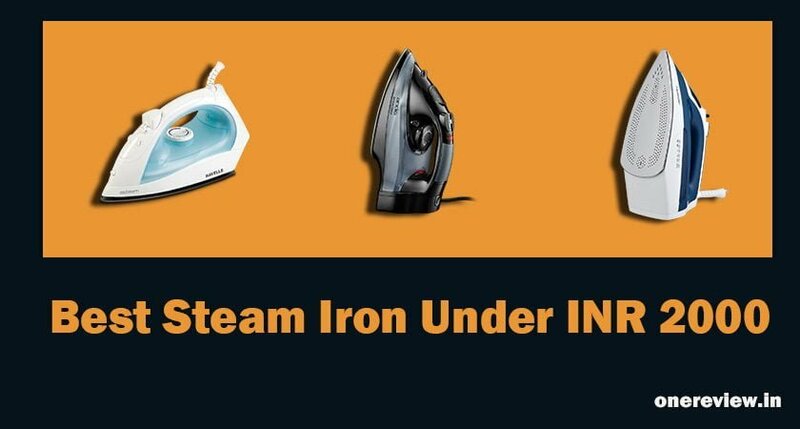 This blog post covers all the best of the best steam irons featuring specifications as mentioned above. So, just go through the list of our best steam irons in India below Rs 2000 and pick out the desirable one. 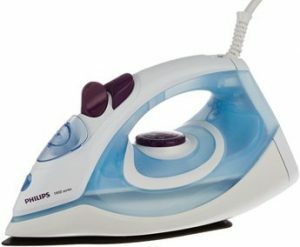 Get the better and quick ironing experience with this one of the best steam irons from Philips. This sleek and stylish steam iron is feature packed with super fast filling and emptying holes, pointed tip, and smooth gliding soleplate. All these features make the ironing very quick and convenient. It’s spray function produces fine steam that evenly dampens the fabric and making it easier to remove out the creases and wrinkles from the clothes. 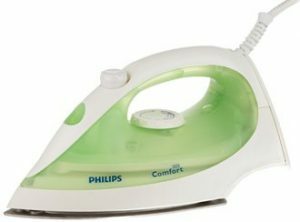 This is by far one of the best steam irons from Philips. Features like easy to use, easy to clean, superb comfortable grip, and the vertical steam function make this steam iron super awesome. Especially its aluminum sole plate is the best part that never sticks to any type of fabric. Also thanks to its continuous steam function that lets you iron your clothes much faster. This steam iron from Philips also comes with a calc clean function that flushes out all the calc particles and thus keeping it clean and free of scale. Are you searching for the perfect steam iron for a large household, your search ends here. 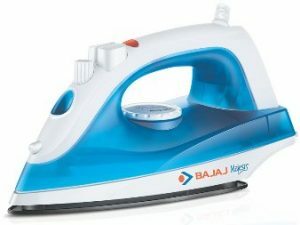 This Bajaj Majesty steam iron is one of the best steam irons with loads of features. Featuring non-stick soleplate, vertical ironing, a cool touch body, and self-cleaning function, this one is an absolute buy for any modern home. It flattens out the toughest creases and wrinkles with its multiple features. For uniform distribution of heat, this steam iron comes with 19 vents that deliver out powerful bursts of steams to make your outfit wrinkle free. This steam iron uses 1200 Watts of power for quick heating as well as efficient performance. One of the best features of this steam iron is the thermostatic control that lets you choose the temperature settings that compliments your fabric you wish to iron. Also, the 360-degree swivel cord makes this one easy to contrive. Loaded with awesome features, this one model from Havells is one of the best steam irons and absolutely a perfect pick. This steam iron not only looks stylish but also makes your linens and clothes wrinkle free. This steam iron comes with a non-stick coated ceramic soleplate that is rustproof and corrosion resistant. The nonstick coating of the soleplate helps the iron to glide over the clothes very smoothly. It is also featured with the thermostatic control that lets you control the temperature according to your convenience. Its lightweight nature makes it even handier, and you can easily carry it out wherever you go. 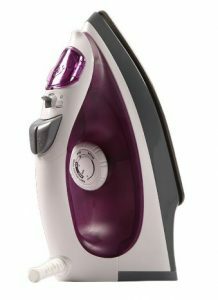 This steam iron also comes with a swivel cord and an indicator light that makes it score high on the aspect of utility. 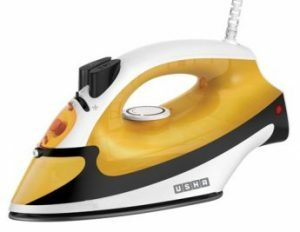 Usha is a renowned brand, and this one steam iron from Usha is absolutely your best pick if you are seeking for the best steam irons under Rs 2000. This steam iron comes with a Poly Teflon coated nonstick sole plate for smooth gliding and ironing. What is especially best is its dual steam burst feature that allows you to use both the horizontal steam burst and vertical steam burst as well. The iron also comes with a self-cleaning function that prevents clogging of the steam vents. With its powerful fine mist spray, you can easily remove even the toughest creases and wrinkles. Featuring compact design and superior performance this Morphy Richards steam iron is one of the best steam irons under Rs 2000. It perfectly suits its name by gliding effortlessly over the garment fabric. This iron is light weighted and big on performance. 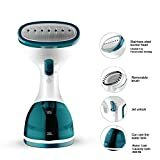 It easily tackles the creases by ejecting out 15g/min of steam and removing the very stubborn wrinkles at the same time. 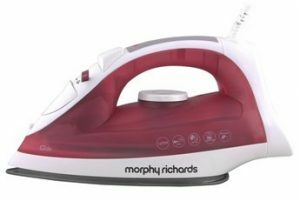 This Morphy Richard steam iron is featured with nonstick soleplate, vertical ironing, anti calc function as well as auto cleaning function. Its ergonomic design allows you to get a comfortable grip on the iron handle. With this handy steam iron, you will absolutely get the professional results at home. 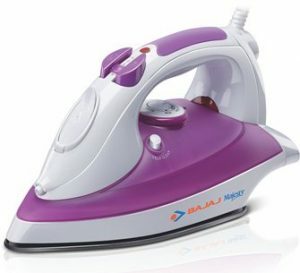 Feel more confident and sophisticated in your clothes with this great steam iron from Bajaj. Equipped with a light weight feature and cool touch body, this steam iron must be your perfect pick. It comes with a rubber grip that makes it easy and comfortable to hold the iron while ironing. It also comes with a powerful steam burst function that can easily remove even the most stubborn creases. Its thermal fuse feature automatically turns the iron off when it reaches the desired temperature. And so reduces the chance of overheating. This is all about the latest and best steam irons under Rs 2000. So tackle the most stubborn creases and power through your stack of clean laundry by picking out the best one mentioned above. All these are picked from the best brands, and so the quality is completely assured.